Dion Drummond’s Aboriginal name is ‘Moogera’, meaning storm. He is of Torres Strait Islander descent on his mother’s side, and Aboriginal from his father’s side. Dion was born in Mossman (Kuku-Yalangi Tribal area), 80km north of Cairns, Queensland. 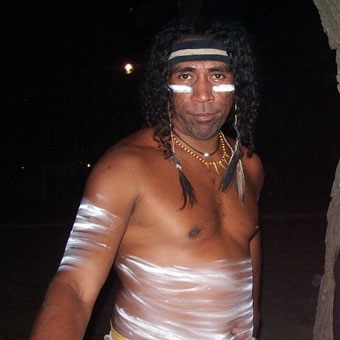 Dion is one of Australia’s most experienced Indigenous performers, covering both Mainland and Islander culture as a dancer, singer and storyteller. Dion Drummond has toured internationally with Descendance Aboriginal & Torres Strait Islander Dance Co. and Jose Calarco for many years, as far away as Moscow, Qatar, Spain, and recently Hong Kong. He has frequently done workshops and shows in schools in Australia with Arts Queensland-NGM and overseas, and regularly participates in community events. In the past he has done Humanitarian projects for UNESCO and assignments for the Australian Government. Dion’s tours have included residencies and festival performances for the Hawaii Honolulu Festival, The Asian Football Cup, NAIDOC Ball & Aboriginal Awards, and NSW Aboriginal Health Awards; as well as working with other corporate shows and international conventions he has also performed in workshops, galleries, theatre, museums, expos – even in jails and on cruise liners! In his school visits, Dion shares tales and artifacts from his cultures, teaching students about the different traditions of both Torres Strait Island and Aboriginal storytelling, song and dance. Students participate in learning a little of the language, including some songs, as well as a look at the skills of Indigenous dances.